Published: May 9, 2013 at 08:32 p.m. 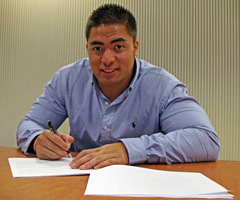 Updated: May 9, 2013 at 09:47 p.m.
Manti Te'o officially is under contract with the San Diego Chargers. The second-round pick was one of four draft choices signed to a deal Thursday, the team announced. In addition to Te'o, the Chargers signed wide receiver Keenan Allen, outside linebacker Tourek Williams and quarterback Brad Sorensen. Terms of the deal weren't disclosed. The Chargers have yet to reach contracts with first-round pick D.J. Fluker and fifth-round pick Steve Williams. U-T San Diego reported that both will be on the field Friday for the start of the Chargers' rookie minicamp. As for Te'o, count this as another small victory. A few months ago, he was a notorious national talking point. Now he's in relative anonymity, quietly preparing for his maiden voyage in the NFL. Getting his contract done quickly keeps the waters tranquil.